It’s not often people gives decades of service to a volunteer organization. 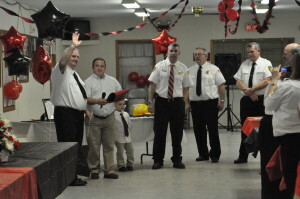 But on Saturday night, dozens of community members gathered to honor John McCullen for 50 years of his time with the North Granville Hose Company. McCullen’s son, Chief Scott McCullen, planned a surprise for his dad along with other older members of the crew. “It was hard to keep it a secret; you can’t keep secrets from him,” McCullen said, because his father is still so involved with the company. He told his father they were going to a fireman’s banquet in Fort Ann, but they had to stop at their own firehouse on the way to check on a problem with the furnace. When they walked in, however, there were more than 70 members of the former chief’s family, friends and fellow firefighters, and McCullen was completely surprised and visibly moved. “He’s very active. He’s always here, mowing the lawn, bringing coffee to the men on a call or doing something,” McCullen said of his father. John McCullen said he and the fire department have come a long way. His son said he was fire chief for seven and a half years, and is head trustee after 30 years in that position. “Even though he’s not active, he’s still in it 100 percent,” said Ed Granger of Able and Ready Heating, who has known McCullen for five or six years. “The man’s got a big heart. He’s here all the time when somebody needs him, he puts the community before himself, he’s always happy and he does a lot for the fire company,” Granger said. After everyone at the party, various members of the community gave testimonies to McCullen’s service and honored him with gifts and awards. Mary Emery represented the Granville Town Board in presenting McCullen with an official proclamation acknowledging his years of service to Granville. “That’s quite a milestone; it’s not something that happens every day,” Supervisor Matt Hicks said Monday. Walter Blake, president of North Granville Hose Co., has worked alongside McCullen for 30 years. “We had a lot of time in the tanker. I appreciate him being here with us, and I’ve enjoyed working with him — it’s always good,” Blake said. McCullen quietly accepted the honors given to him, waved every time the group clapped and thanked everyone for coming. And he didn’t indicate that he’ll be slowing down anytime soon.